QO stands for Qwik-Open. Square D QO Circuit Breakers are fastest tripping circuit breakers at 1/60th of a second. QO™ Circuit Breakers provide the high level of protection you expect from Square D. When it comes to electrical protection, fast response is critical and QO™ Circuit Breakers can trip faster than the blink of an eye. The exclusive QO™ Visi-Trip™ instantly identifies a tripped circuit breaker with a red indicator window. When a QO™ Visi-Trip™ circuit breaker trips, the handle snaps to a midpoint position between “OFF” and “ON” and a highly visible, red indicator easily identifies the tripped breaker. The Visi-Trip™ reduces the number of callbacks, as well as the chance that other circuits will be turned off accidentally. Quick make – quick break mechanism. Trip reaction within 1/60th of a second. 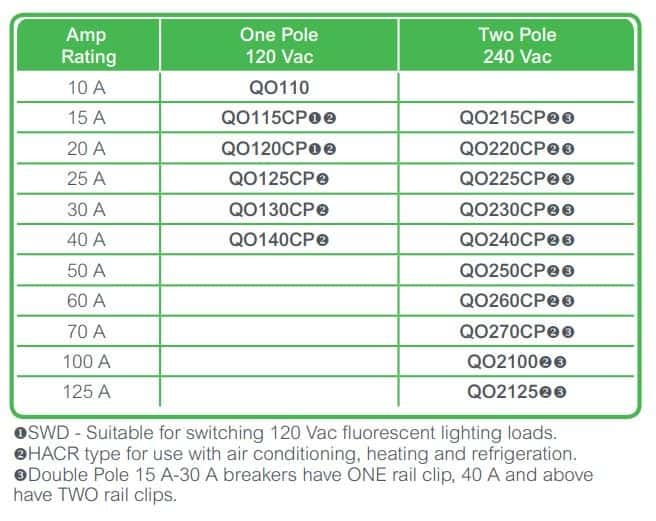 Single Pole 15 A and 20 A breakers are Switching Duty Rated (SWD). SWD – Suitable for switching 120 Vac fluorescent lighting loads. Option for padlocking breaker in “ON” or “OFF” position. Slot/Robertson screws for wire termination. High magnetic breakers are recommended for applications where high initial inrush current may occur. Tandem (Space Save) circuit breakers are ideal for adding additional circuits to an existing panel with limited space. QO™ Ground Fault Circuit Interrupters (GFCIs) combine the same level of overcurrent circuit protection as standard QO™Circuit Breakers, with ground fault protection for personal protection against electrical shock. GFCI protection is required in wet or damp areas such as bathrooms, kitchens, garages, spas, pools and outdoor receptacles. Do not connect to more than 250 feet of load conductor for the total one-way run to prevent nuisance tripping. Provides overload and short circuit protection combined with Class A ground fault protection. Class A denotes a ground fault that will trip when a fault current to ground is 5 milliamperes or more for people protection. Yellow push to test button. Detects unintended arc faults, overloads and short circuits. White push to test button. Plug-on CAFCI version helps minimize installation time by reducing the number of runs and wires. Results in cleaner and faster wiring. Ideal for inspection. 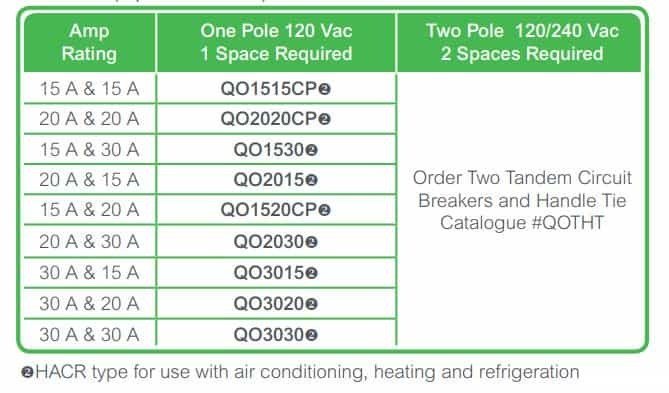 The Plug-on CAFCI breaker can only be installed in Square D Plug-on neutral ready loadcentre. Saves time – equipped with TIME SAVER diagnostics feature that assists in identifying the type of fault in a circuit. All Square D QO combination arc fault circuit breakers come with a TIME SAVER diagnostics feature that assists in identifying the type of fault that has occurred when the breaker has tripped. Requires no tools – easy to use. How to use: turn off the circuit breaker, HOLD DOWN the Push-to-test button, and then turn the circuit breaker back on. Use the chart below to determine fault. Square D Dual Function circuit breakers combine combination arc fault and ground fault protection in a single device. The dual function circuit breaker meets the 2015 Canadian Electrical code requirements for combination arc fault protection in the home, while also offering (Class A – people protection) ground fault protection. This unique combination saves space in the panel and installation time for the homeowner or contractor, replacing the arc fault breaker and a ground fault receptacle combination. Ideal for the bedroom and bathroom, where one dual function breaker can arc fault protect the bedroom and ground fault the en suite bathroom. Another application is an outdoor receptacle where the dual function breaker can provide arc fault and ground fault protection inside the home instead of exposed to the outdoor weather. Detects unintended arc faults, ground faults, overloads and short circuits. Purple push to test button. Offered in both pigtail and non pigtail versions. Plug-on version helps minimize installation time by reducing the number of runs and wires, ideal for inspection. QO™ Main breakers are bolt-on for all residential service entrance loadcentres. Standard 22,000/10,000 ampere series short circuit current rating on main breaker panels provides increased application capability. Provides option for padlock in “OFF” position.